If you're living in this Loudoun/Dulles or the surrounding area this is not news to you.... We JUST had 34.5 inches of snow, and 2 snowfalls within the previous week totaling about 10 inches of snow, and now we're expecting another 5-9 inches beginning tomorrow. Because our area rarely experiences this kind of snow (well, this is actually the snowiest on record), we simply aren't equipped. So, be patient. Life will return to 'normal'. For now, relax and enjoy. Streets: VDOT is calling in reinforcements from areas nearby that have completed their own snow removal because they didn't get the 'dump' that we received. 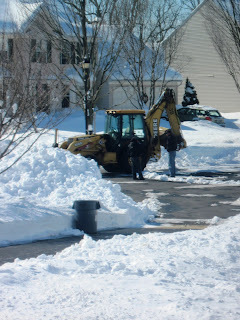 (FYI - the Town of Leesburg has done a great job of snow removal). Relax - the calvary IS coming! Important Reminders: I am getting emails and texts and want to pass along the important reminders to you. 1 - Roofs are caving in. If you have a flat roof, please remove the snow from it - if it collapses, it could kill your family, not to mention ruin your home or business. If you have a roof that's at an angle, well, advice is conflicting. I say if you can knock the snow nearest your gutters loose (like with a shovel or broom, etc. ), then do it. Generally it will cause it to slide, much of it sliding off your roof (think avalanche, and don't stand where it will fall). This will relieve pressure. If you can reach any part of your roof from a window, try. 2 - Please clear the snow from around your fire hydrants. If there is an emergency in your neighborhood, please don't lose valuable time having to find the fire hydrant. It can be the difference between life and death. 3 - Make sure your home and address are clearly visible from the street, so there's no delay if emergency services needs to get to you. 4 - Check on your neighbors - especially those that are olders or ill, but really, check on them all, and call authorities if needed. If you are truly buried in the snow, they WILL send in the national guard - this happened in 1996 to my neighborhood in Ashburn when a boy got stranded at a babysitter's house during a blizzard and ran out of a critical medication he needed. 5 - Clear the snow from around your heat pump - covered HVAC systems can't breathe and this puts strain on the system and you could lose heat. That would stink. And, oh, yeah, it's a rather costly repair. 6 - Clear snow from around the gutters, windows, and doors to prevent leaking. 7 - Remove snow from decks and porches. 8- If you are experiencing problems - downed trees, need help clearing your driveway/sidewalks, repairing roofs, sidings, decks or porches contact a qualified contractor. I recommend William Beach (Beach Carpentry and Contracting, based in Leesburg): 703-898-2789 or 703-443-8946. 9- Stay informed about important weather related news. Sign up for Loudoun Alert. You are strongly urged to do these things NOW, so as to avoid further complications when the next storm hits - tomorrow. Stay tuned to Living In Lo Co continuing local information. Personally, I am getting a little tired of writing about snow... but what else could I possibly write about at this particular time? This is truly historic and a little mind blowing. Hang in there!! Thanks for the useful tips and stay warm during this Snowmagedon!!! !